Our family has a routine on Friday nights, we all shuck off the weekday stress, get into jammies and sit down to enjoy a movie together. We have been doing this for years without even realizing it was a routine until one Friday when Chelsea was aghast when we had other plans. It’s almost embarrassing to say how many movies we have watched but honestly it’s time our family values and I’m all about being comfy while bonding with our girls. Previously we’ve rented from our cable company but my husband noticed Redbox kiosks popping up around town last year and we decided to check it out. 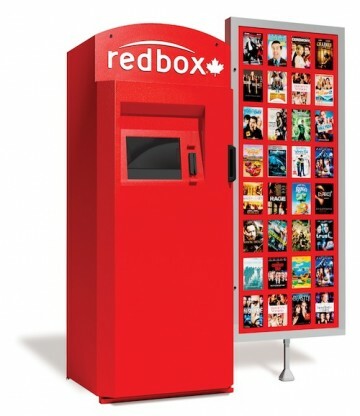 Redbox is Canada’s largest DVD “rentailer” with more than 1,350 automated kiosks across all 10 provinces. Redbox, founded in the United States in 2002, installed its first Canadian kiosks outside of Vancouver in May 2012. Today, Redbox kiosks can be found across Canada. Redbox kiosks make movie rentals easy for us, they’re located in so many places and we can return our movie to ANY Redbox kiosk which means as long as we keep the movie we’ve watched in the car it’s not a hassle to return. For the month of October Redbox is giving people a FREE rental on Thursday nights. To receive a free one-night DVD rental on Thursdays in October (Oct. 9, 16, 23 or 30), all you need to do is visit a Redbox kiosk, enter the promo code THURSDAY at checkout and swipe a valid credit card to cover any additional nights you hold onto the DVD. If you return your DVD by 9 p.m. local time the next day, there won’t be a charge. Enter your email at checkout to be sent a receipt. To locate a Redbox kiosk near you and you can also reserve a movie online at www.redbox.ca. 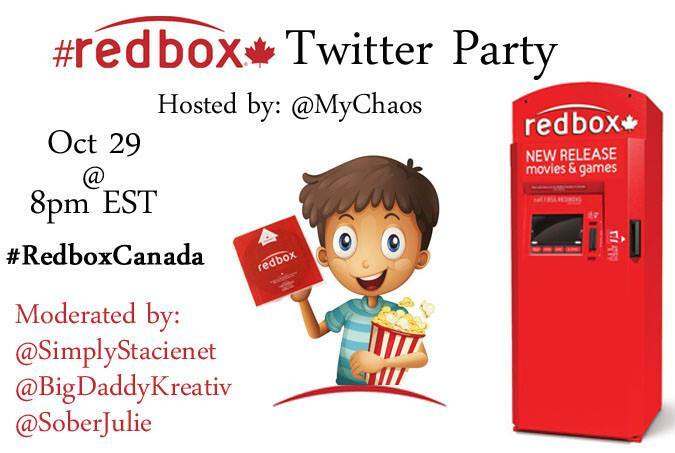 The kind folks at Redbox Canada are allowing me to give one of my lucky Canadian readers FREE movies for a year! That’s 52 free dvd’s or $1.50 to put towards a Blue-ray or video game. This giveaway is open to residents of Canada, 18+ all entries are verified. Entry is simple, just fill in the form below. All entries will be verified, this contest ends on November 13th, 2014. The winner will have 48 hours to respond. Please follow the host, sponsor and moderator and rsvp on the linky below! No I haven’t used this before. Thanks for chance to win , great giveaway. I have never used it but I will one day. I haven’t used it before. No I haven’t, but have looked at the offerings. No I haven’t used it. I haven’t yet but it sounds great! I’ve used it twice, we just started two weekends ago making it our Friday night movie night. Yes, we use Redbox quite regularly! We love Redbox – I love that some of their locations are outside, so you can return on holidays without worrying about the store being open. We have never used Redbox. I have never used them but see them around. I have not used Redbox, but my brother does and loves the how convenient it is. I have never used Redbox but there is one close-by. We have never used Redbox but there is one here in our small town so I am thrilled. Thanks for the giveaway! I have never used Redbox before but I would like to try it out! I have used it. It’s so easy and practical. We’ve used it a couple times before. I haven’t used Redbox yet. I haven’t used a Red Box yet. Likely since I don’t really see them anywhere. But I did see one recently. we haven’t…I keep meaning to but just never have. I have not used Redbox yet but would really like to try it! We just started using Redbox because of a free movie we got and we love it. Will definitely continue using it. We use Redbox a couple of times a month. Yes ..we love redbox for movie rentals, fast and easy and cheap!!! I have never used REDBOX before. I haven’t tried RedBox but I have tried a similar service before. Yes we go to our local Walmart and use Redbox all the time. Yes, there is a redbox at our local Safeway and we use it fairly often. It’s great, we love it! I’ve seen the Redboxes in lots of places, but no I haven’t rented a movie from them. I have never used Redbox before but it sounds interesting. i have seen RedBox but i have never used it. No we have never used it. No but I have just recently noticed it at the Metro store.This is a lovely giveaway!! We use it often. I love how convenient it is! Awesome! I haven’t tried Redbox yet. We have used redbox :) So convenient & reasonable! No I’ve never used Redbox. I’ve never used it before but I’ve seen it outside a grocery store. No I haven’t used this before. Thanks for chance to win! I have never used Redbox, but I will for sure!! I have tried to use it having gotten some free codes but there was problems and the codes didn’t work and I didn’t get my free movies, tried the codes again another time and it said they were not usable though they have not expired and the transaction was never completed. I have not use Redbox before. we just used it today to rent spiderman 2! I’ve seen it in my grocery store, but haven’t tried it. I have never used Redbox before! No, I’ve never used a RedBox! No, I haven’t used Redbox. No, I have not used Redbox in a comment. I have :) My boys induced it to me. Yes, I have .. and it was the simplest thing I have ever done! No, I’ve never used Redbox. No, I haven’t used Redbox before but I see it every time I go to the grocery store. I haven’t directly used Redbox yet but our friend is always bringing over movies from Redbox – I didn’t realise they could be returned to any location until it was mentioned this week now I’m excited to try it out over the long weekend! I’ve never used a redbox before. I’ve seen two of them, but didn’t have time to stop and check them out. Yes I have used one.. so easy and cheap! Definitely…and so convenient at our Safeway. I haven’t used redbox yet- but I really should! I have 4 nearby! yes I have rented from red box a few times! No, I don’t believe I have ever used Redbox in a comment, until now!